Deliver account, holdings, transactions and performance reports in one package. Visually depict results with appealing graphs and charts (automatically created). Leverage scalable technology to produce a single presentation on demand, or schedule tens of thousands at a time. Present results that truly reflect how the account is managed based on your firm’s specific asset classes and subclasses. Create reports that appear to have required hours to produce… but really took minutes. Personalize content with individual customer messages, as well as investment and marketing pages. Include or exclude desired reports from any package. Tailor the details within each report using customizable parameters. Combine multiple accounts to meet family- based reporting requirements. Create reports from customized templates developed exclusively for you. Perpetuate your brand through consistent design and controlled content. Save preferences per client for consistency month after month. 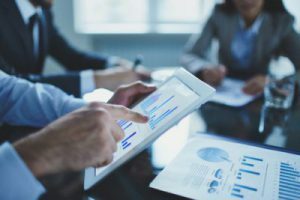 As many of the industry's leading firms have discovered, InvestEdge serves a critical role in meeting the most demanding reporting requirements. In addition to making it easier and less expensive to create outstanding presentations-the system provides true competitive advantage. The key to InvestEdge is flexibility. 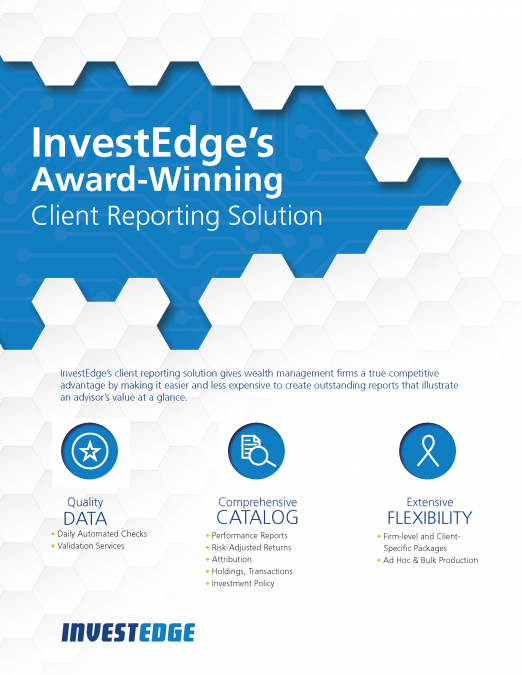 Unlike other systems, InvestEdge is easily customized to specific client reporting requirements – the look of reports, as well as all content, is exclusive to you. And because InvestEdge includes the ability to apply unique asset categories and subcategories, reports accurately portray how each account is allocated. Plus, detailed attribution analysis equips you to demonstrate the value of your management style. With InvestEdge, investment professionals or performance reporting groups can schedule and produce large numbers of customized reports at period ends, or single reports on demand for client meetings or requests. The system automatically translates account, holdings, transactions, and performance data into a consolidated report package. It even inserts a personalized cover page, page numbers, and table of contents. The system enables report customizations at the client level as well. You can easily select or exclude specific reports for each package, as well as the individual content for each report. Then, the preferences can be saved and re-used each time the package is run. InvestEdge also offers flexible report delivery options. Completed reports can be printed in-house at the firm, sent to a professional printer for assembly and distribution, or made available electronically with secure authentication via a portal.